Well the weather has certainly cooled off in the Ottawa area. I’ve been a little under the weather as well for the last few days. Like Chris says though, we travel all the way to Alaska, down the west coast of the USA and across the south before coming back to Ottawa, and all without the hint of a cold. As soon as we get set up. in Ottawa…I get sick. What’s with that?! No idea personally, but all things will pass. 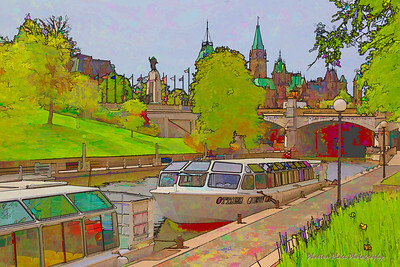 We did manage a trip into downtown Ottawa this afternoon to run a few errands and we enjoyed a nice walk along the canal. How can you tell it is spring time in Ottawa? Road construction everywhere! This entry was posted in Ontario, Photography.